Twingly, the Swedish startup that brought us a microblogging search tool, a search engine for blogs, and a global ranking system for blogs, is launching a new product called Twingly Channels. Twingly Channels, which will officially launch in closed beta in October, will allow users to create their own personalized real-time memetracker. A mix between Digg, Friendfeed and Techmeme, Twingly Channels allows users to create their own personalized memetracker by collecting feeds and search terms covering any topic or event into a channel they share with others. 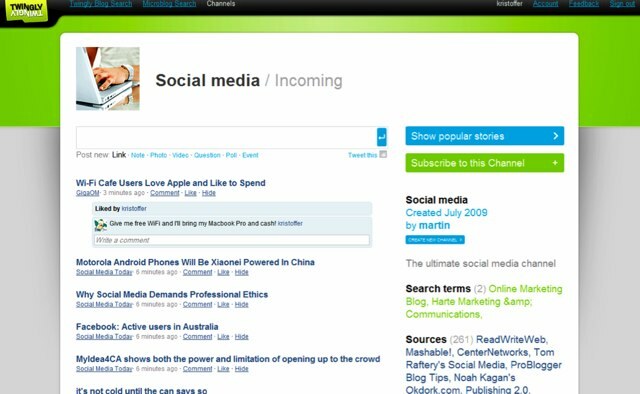 Twingly Channels, which is updated in realtime, has three main sources of content: links posted by users, content from RSS feeds, and real-time search results for terms from blogs and microblogs (i.e. Twitter). The resulting stream is filtered into a Friendfeed-like channel where people can comment on, like, or dislike incoming items. Channels will be public by default, but to comment or subscribe you will need to sign up. You will also be able to login with your Twitter or Facebook account. One interesting component is a ranking system to filter content. Every item coming into the channel is continuously ranked using links from blogs, Tweets, user comments and likes. The highest ranked items are shown in the Popular view. The site sounds like it could be incredibly useful for aggregating RSS feeds, tracking specific content on blogs and microblogs and then sharing that content with others, all on one site. 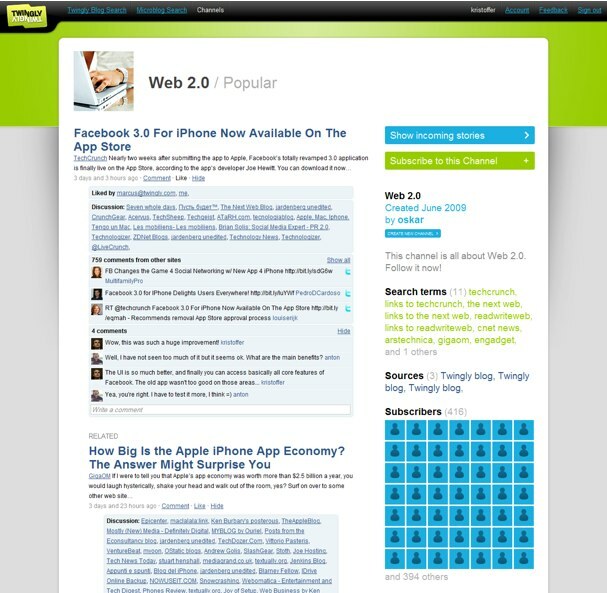 The blog/microblog search is powered by Twingly’s search engine which tracks close to 26 million blogs around the world.